Specially designed with extra comfort in mind. Based on the Criterion Traveller range but shorter and with a different ratio of down distribution. 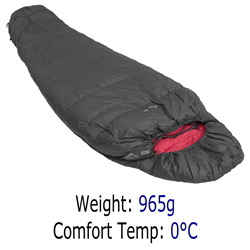 Criterion Lady sleeping bags include a polar fleece insert in the foot area for extra warmth and comfort. All Criterion Lady sleeping bags have the same appearance and colour. They differ only by their down quantity and by the sizes of their stuffsacks. Compared with the equivalent men’s sleeping bags the Criterion Lady models are shorter. They contain the same amount and quality of down, which has been redistributed to provide additional filling in the base and in the feet area. A polar fleece insert is included in the box foot area to provide additional warmth and comfort. Length 207 cm; Maximum person height 175 cm. For full information about the key features see ‘Technology‘. the filling is white Polish goose down, whose Fill Power rating is 700 cu in.